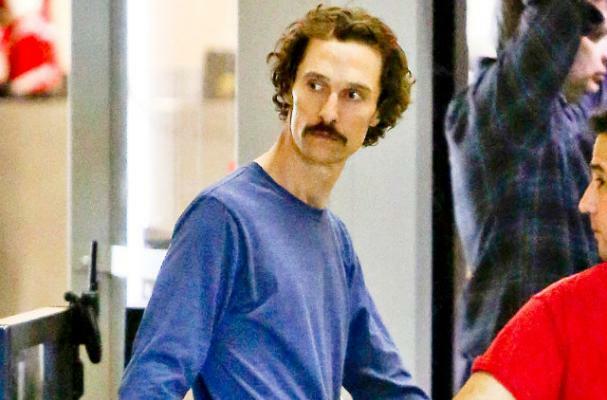 Matthew McConaughey has lost a shocking 38 pounds for his role as an AIDS victim in the upcoming movie The Dallas Buyers Club. The actor says he certainly has a lot less energy than usual and is trying to stay away from restaurants with aromatic smells that will having him craving junk food. "I'm doing cardio but I'll tell you what, the more I've learned is -- and I think it comes with age too -- is it's 90 percent diet. It's 90 percent amount and then what you're eating because right now I'm not losing any more weight if I burn 1,500 calories, two hours of cardio in an afternoon, or if I don't. It doesn't matter. It's a mater of how much I eat or how little I eat," McConaughey said. "The organs shrink, so my stomach has shrunk as well. So as much as I can't wait to have that cheeseburger, on the day, it'll be damn hard to eat the whole thing. I choose to pick my places where there's less good smells and temptations. I don't want to be doing this interview at a Pizza Hut buffet." McConaughey is down to 143 pounds and isn't planning to lose any more weight.